Anxiety Cure? A must have comfort blanket for all ages? Doudou is French for a comfort blanket. This soft and cuddly natural cream rabbit from Doudou et Compagnie of Paris would make the perfect addition to any nursery. The rabbit measures 10 cm and comes complete with a towelling Doudou or comfort blanket. Both are beautifully presented in a gift box. This item is suitable from birth. I bought this as a gift for a newborn baby and I was very pleased with my choice. It's a lovely item, lovely quality and beautifully presented in it's own fold out box. The rabbit is made from a lovely soft plush fabric and is the perfect size for a new and small baby. The baby won't appreciate the lovely packaging but his parents will do! 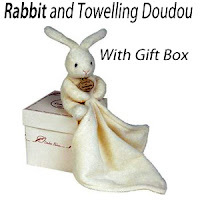 nice soft material with cute rabbit - well presented as a gift - would recommend this item. I received two - happy to have one as a display item and one to use.